Thank you in advance for your generosity and most especially for your continued support of our gifted athletes through your gift to Special Pops Tennis. Your donation will change many lives, including your own! You can make a one-time donation, a monthly, quarterly, or annual donation on our website or via US Mail. Click on the Donate Now button below for online donations. To donate by check download and complete this Mail Donation Form. When an organization seeks financial support, the request is often accompanied by a list of achievements. Added 3 training locations in local communities where people with intellectual disabilities have not previously had an opportunity to play tennis. If our participation rate equaled the tennis participation rate for the typical population, we could reasonably triple participation within Special Pops Tennis beyond our existing 14 sites. Made more opportunities to compete and travel to tournaments available to athletes who may not be able to afford the associated costs through an Athlete Scholarship Program. Enhanced and improved our coaches training programs with video and more frequent hands-on training. Download a copy of an Example of our Sponsorship Opportunities and Levels. 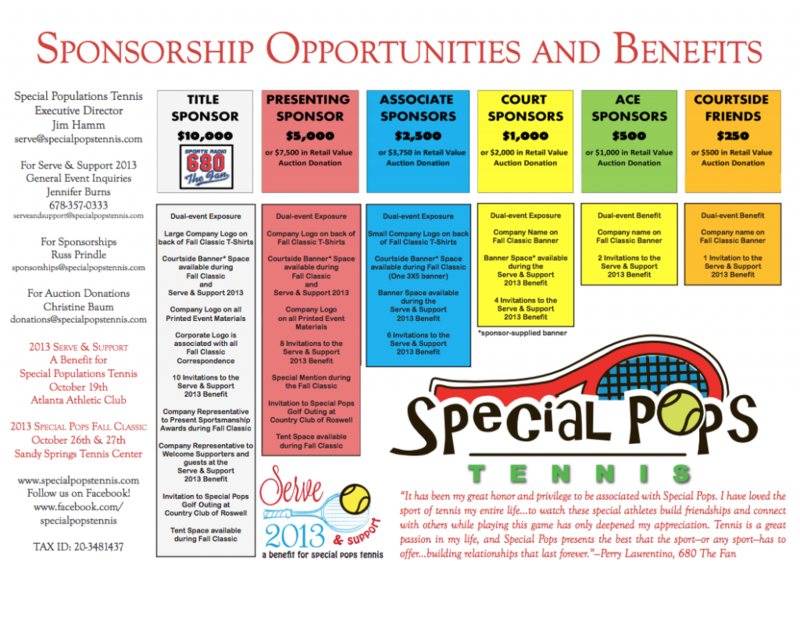 For additional sponsorship information please contact serve@specialpopstennis.org.